For those only interested in the “treasure”, then jump to the end. PS. You’ll need to read this anyway as there is a clue in the text. Ha! “Ah, you’ll meet Yul Brynner. Give him our best wishes please”, said someone when I mentioned we were heading for Kauehi next on the morning Pan Pacific Magellan Net (8173Hz @ 0800Local). Utterly confused, I asked what on Earth they meant. It turned out that the head honcho and centre of the village hierarchy, the man that ran the shop and seemingly the driving force in the Kauehi community, bore a strong resemblance to the film star. Now we have met him, we concur. Having entered the lagoon with no issues, we headed straight for the village of Tearavero. According to the charts, the direct route across the lagoon is absolutely clear of bombies, a first for us in the atolls. Distrusting this information we kept a close lookout but saw nothing. The first coral we saw was a large reef about 0.5miles off the village itself. I am not sure why but unlike every other motus, there are very few bombies within this atoll. Some strange dynamic, I’m sure. We anchored 400m off just in front of the red post marking the end of the reef running out on the N side of the village, in about 25’ of water. 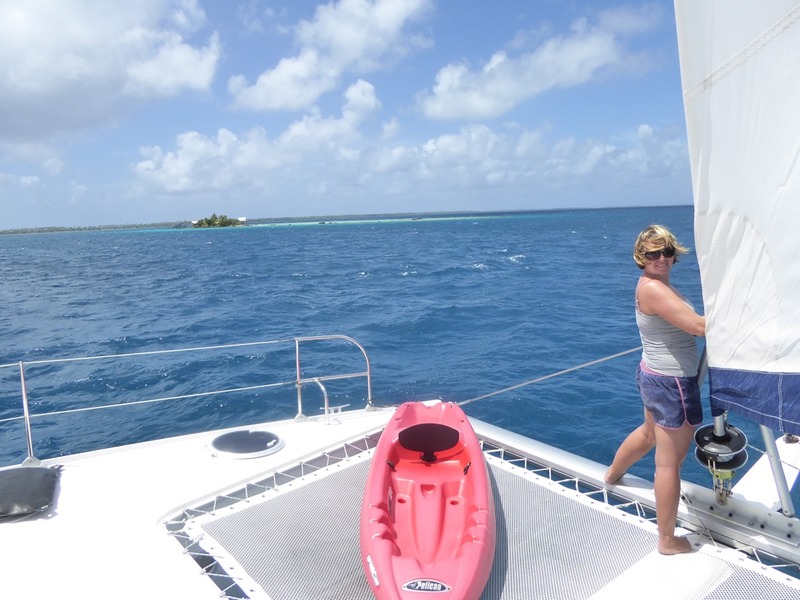 We picked up and repositioned once to ensure we wouldn’t foul on one of the numerous coral heads. There are three anchorages here. The one we were in and then two others going N across two spurs of reef, each progressively more protected from SE winds, but further away from the small pier at the village. There is a French yacht parked here who got here and choose to stop three years ago. Gary, the owner, now runs a diving operation with one of the locals, using a rib to take customers to the pass to dive. After the great bunch of kids and the relative civilisation of Makemo, Kauehi is sleepy hollow. The church bells ring at 0500hrs and then half an hour later to get people moving and presumably get things done before the sun is up. By 0900hrs, the place is a shabby ghost town, seemingly inhabited by land crabs and little else. The village kids have been packed up and sent off to school on one of the other islands. All that are left are the v smalls. You get the impression of life a bit more on the edge here with money not coming easily. Strangely there are no fishing boats working. There is a Post Office and it has a Vinispot hotspot which occasionally works although the term hot isn’t very appropriate. The internet is dreadfully slow and we had difficulty getting mail downloaded, even using HTML. I resorted to HF radio/Pactor to get my weather. We eventually went across to the shop and did indeed met Yul, otherwise known as Tiaihau, who was delighted to hear the messages I had for him from a couple of boats. The shop is not great but has the very basics and a large proportion of the goods are red label. There is little choice. Veg is restricted to potatoes and onions. We were surprised to see baguettes in one of the freezers but didn’t enquire on the price. He does stock beer and after a couple of weeks of abstinence, Lou and I enjoyed a bottle each to celebrate our arrival. 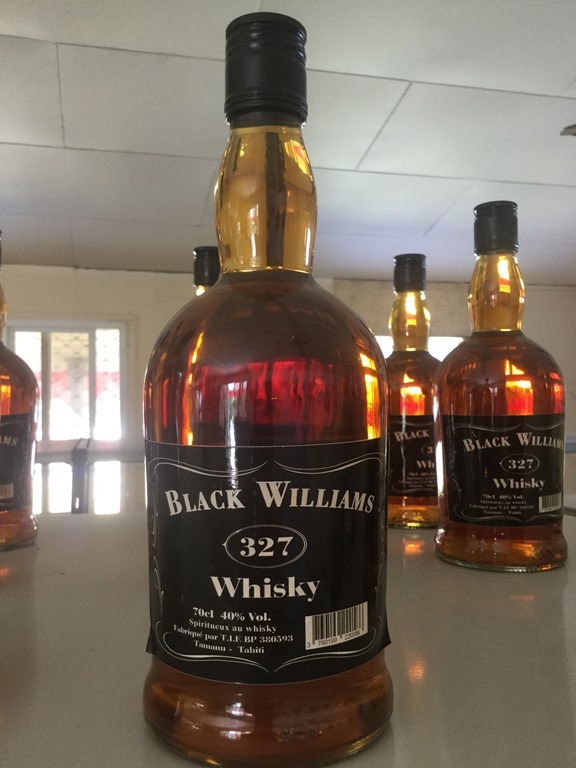 He also stocks one of the dodgier whiskys I have seen, made with love and care in Tahiti……. Anyone ever heard of it? I doubt it gets much of a following on the export market. We stayed around the village for two days, just getting our bearings. On the basis that village festivities, planned for that weekend, had been put back a week, we decided to head to the southern anchorage that An and Ivan on Vagabound had expounded. 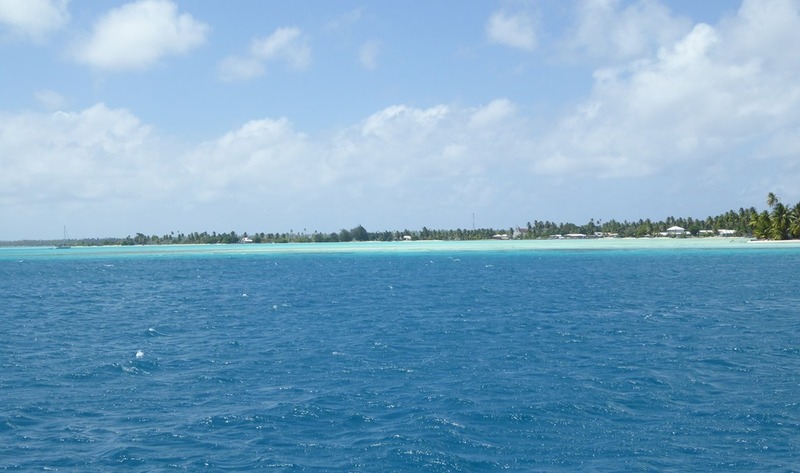 We had a pleasant two hour sail which went past one of the very few genuine islets to be found within an atoll. These days it is a pearl farm base and you need to be a little careful of the oyster strings that surround the it. Most of the floats are a few feet underwater so difficult to spot until you are nearly on top of them. Deeper keeled yachts might find it easier staying to its E as they move S. There are few strings between the islet and the atoll. 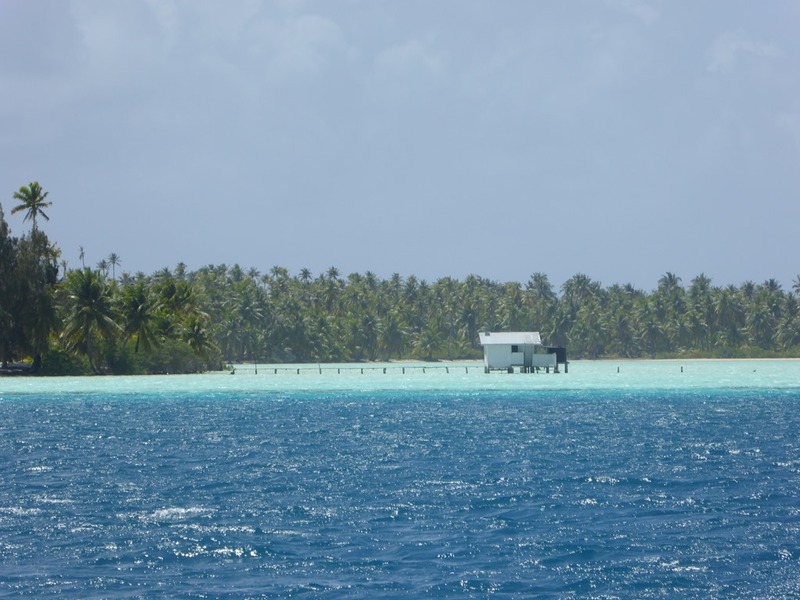 We reached the SE corner of the atoll and anchored in 12’ of water @ 15 57.550S 145 04.796W, just off a motus with a huge collection of fishing buoys decorating a tree by an old copra hut. Sadly these days Kauehi has very little copra industry. Termites have reached this atoll and coconuts don’t survive to dry out properly once they are on the ground which means most of the coconut groves on the uninhabited motus have been left to overgrow. Those coconuts that are collected around the village are stripped out still wet and the pulp is sent off to be made into a skin cream. Thankfully very few mosquitos have moved in to those groves left to themselves. On our motus, someone had tried to keep the ground clear around the hut, probably for family outings down to its beautiful secluded beach. We left the coffee, sugar and milk power sitting on the dresser untouched but did borrow the plastic chairs and the head of a rake. We found a sleeping platform 100m N of the hut. On the basis we intended to stay for a while and to help keep the place maintained we set up a fire to clear the ground spoil. There were piles of partially burnt logs and coconuts dotted around and we used the debris from those first before making inroads to the surrounding area too. We had great fun doing the platform up, cutting new coconut fronds down to reroof it and build some side panels as well. Our weaving wasn’t up to much but it was enough to keep the wind out. 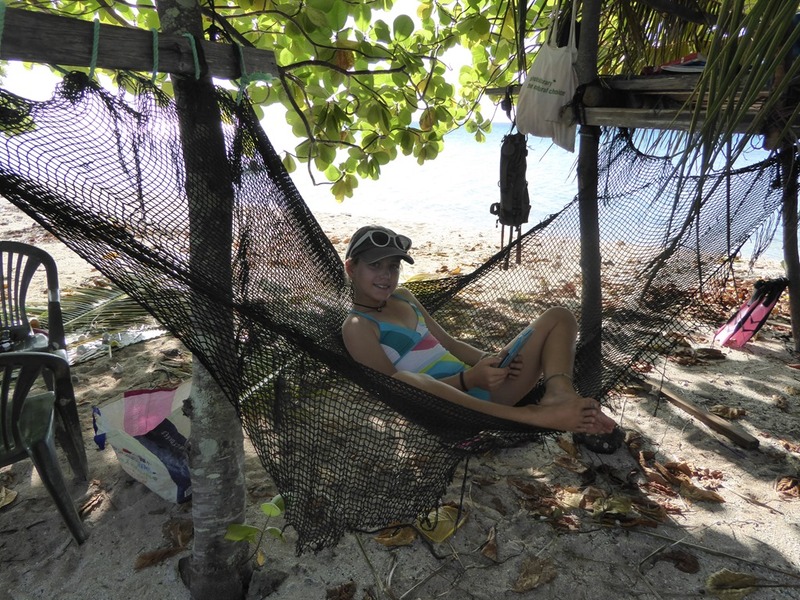 The campsite also gained the sunshade tent and a hammock from ship’s stores. 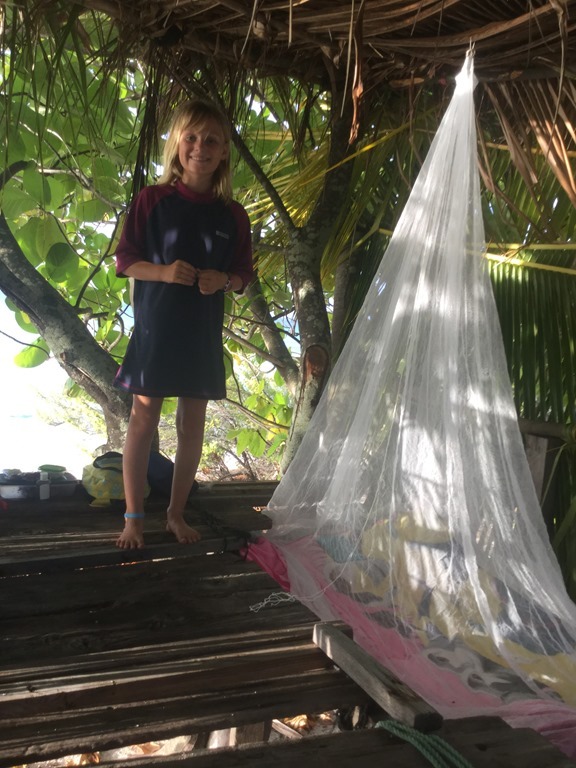 The mosquito net that Kirsty left behind following her visit to Antigua also got an outing and made a very useful piece of equipment for the intrepid explorers. The girls decided that the sleeping platform was too good to waste so announced they wished to sleep ashore. 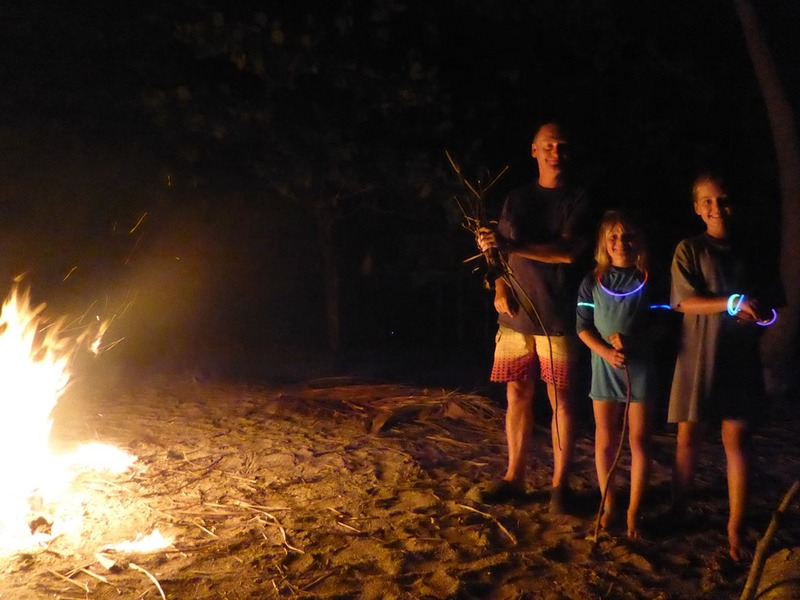 Dad went too for the first night but equipped with a handheld, an approaching full moon giving good light and with the embers of a fire each night to go to bed with, they had soon packed me back off to the boat. The motus was renamed Margaret Motus in honour of my parent’s new Border Terrier puppy, named Peggy, and that became their onshore call sign. Having just read an very interesting article posted by Mike on Sasquatch, on US society’s ever more draconian views on child care and parental neglect, I am quite sure Lou and I would be quickly arrested for our disgraceful lack of parental supervision in allowing the kids out of our sight and care on the motus. My folks, who left my brother and I on the Shiram Mor in the Outer Hebrides as kids, would be equally damned in today’s self-righteous and barmy society. Personally I see it as excellent personal development for them. Although the girls used the radio to keep in touch, they enjoyed the stories about David and I signalling to Mars. There were a few night time visitors to the camp. 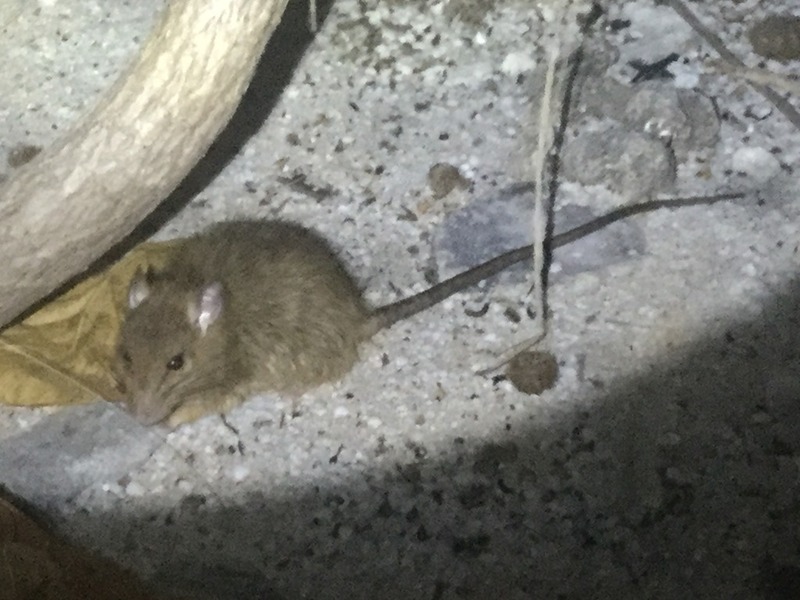 The normal thousands of hermit crabs were joined by a tree rat and then a couple of nights later, we saw two or three brown rats. Tree rats are interesting creatures. As you travel around French Polynesia, you will see tree trunks fitted with wide metal bands to stop the tree rats from climbing them and eating their way in to the coconuts, their staple diet. Their movement is very different from normal rats, being closer to jerboa hopping with big back legs rather than a rat scurrying. The one we followed around eventually climbed a tree to get away from us but was not put out by us following it for some minutes. The rats shot off as soon as we got a light on them. We lost two tupperware box lids to the Tree Rat one night. It chewed the rim of both box lids, obviously using its coconut opening technique rather than just burrowing through as a rat would. The girls were not bothered by either type of visitor and happily ate the cake the tree rat failed to reach. They believed us when we told them they were the biggest, scariest monsters inhabiting the motus! We used an empty all metal milk powder can to stop unwelcome interest in the midnight snacks after that. Over the week we stayed, the fire grew in stature to the point we were burning the main base bulb and trunk sections, 18” in diameter, from a tree that had been cut down. We cleared huge amounts of dead fronds and hundreds of coconuts. Palm oil burns well. Other than one morning when we needed to relight it, it burnt for six days. The only thing we missed were marshmallows, a complete failure on our part, as Eleanor announced she had seen some at the shop but hadn’t told us because she thought they would have been too expensive. We have obviously being going on about the simple life and using up boat stocks too much. We did make up the bread sticks ZigZag showed us how to do back in the Marquesas and these went down well. As an aside, we just got a message to say that Noah has finally decided to start walking. Well done, the wee man! We used some glow sticks that we had bought long go in Puerto Rico so the girls had great fun playing with those. We had some great snorkelling just off the campsite with good coral in no more than 10’ of very clear water. There were good varieties of Angel, Butterfly and Damsel fish and we were always joined by black tip sharks. We came across another shallow coral site a mile to the E of us, three motu up, which was worth swimming on too. H also found out what happens when she puts on my weight belt. Bouncing between bottom and surface to breath and trying to giggle at the same time is not necessarily a good idea! 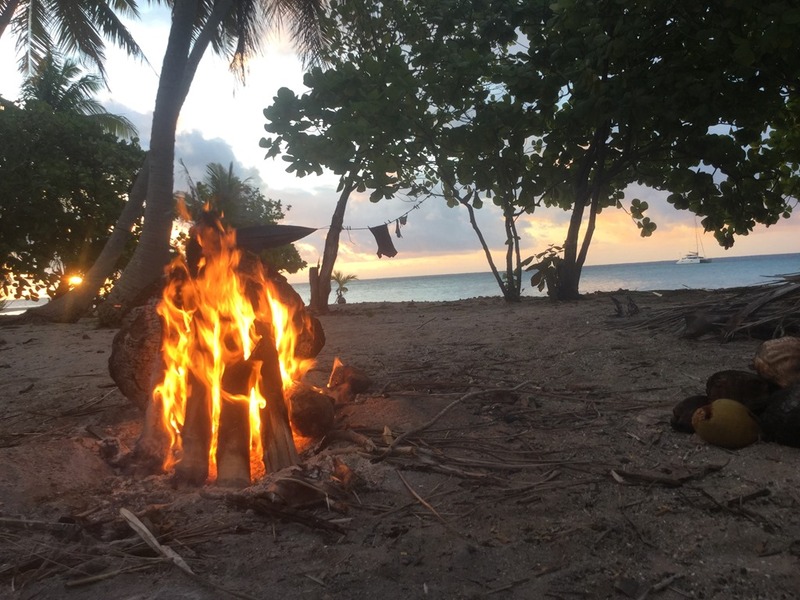 The rest of the time was taken up with reading, feeding the fire, saving suicidal hermit crabs from the flames (a Hannah task), exploring the reef side of the motus and simply kicking back. 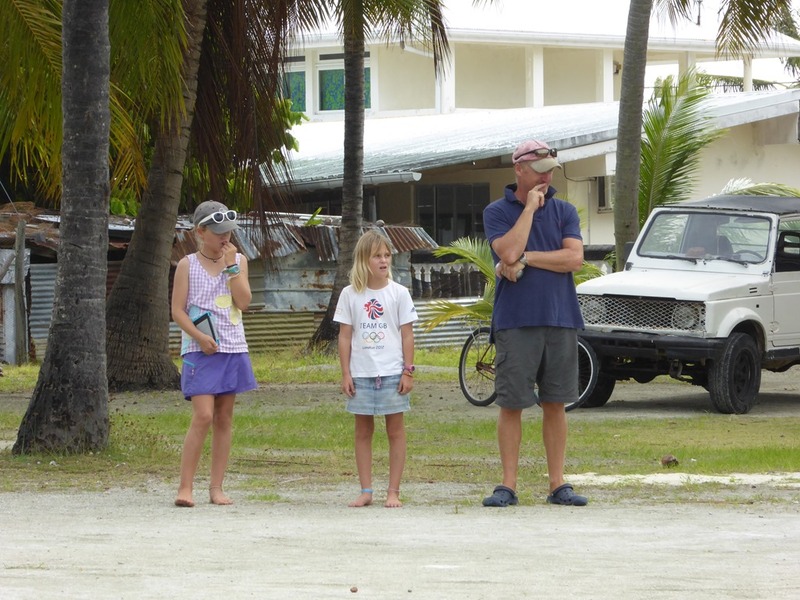 We did look out for what was described as the site of an ancient village called Tuketuke which by local legend was in the SE corner of the atoll but we were unable to find it. I asked a couple of locals about it and I got the impression that no one is sure of exactly where it was. I rather think that the reef has taken it long ago. 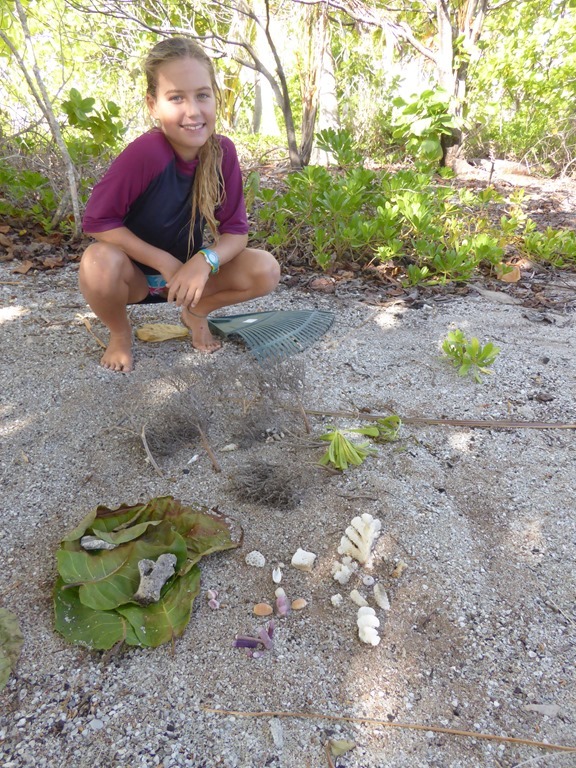 The girls had great fun making coral and shell gardens from their finds on their beachcombing expeditions. 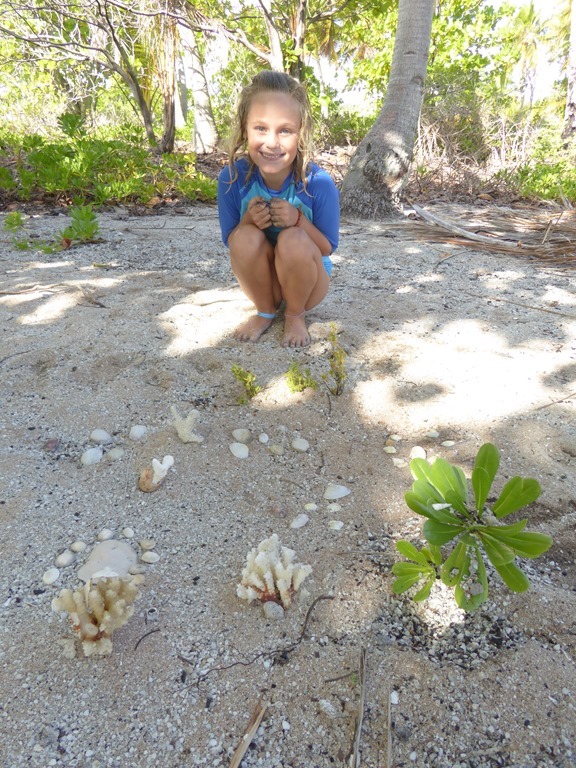 Hannah had a very long, convoluted story about the ‘fortune tree’ in her garden and the hermit crabs were particularly fond of Eleanor’s garden. The night before we travelled back up to Tearavero, the weather blew up with gusts to 32kts which brought torrential rain. Both girls moved into the tent but survived the night no more than a little damp. Having packed up the camp and left it much clearer than we found it, we sailed back N, seeing only three bombies in the 8 miles run. We re-anchored off the village in time to join the delayed weekend festivities. Night one involved chips (frites), dreadful background music (we felt the electronic Polynesian version of Gangnam Style was the highlight! ), the disco run by Yul wearing a very grand coconut frond hat and a nearly 5 a side football match which ended up as a kick about rather than a match. E and H had fun doing gymnastics, watched on by the local kids. 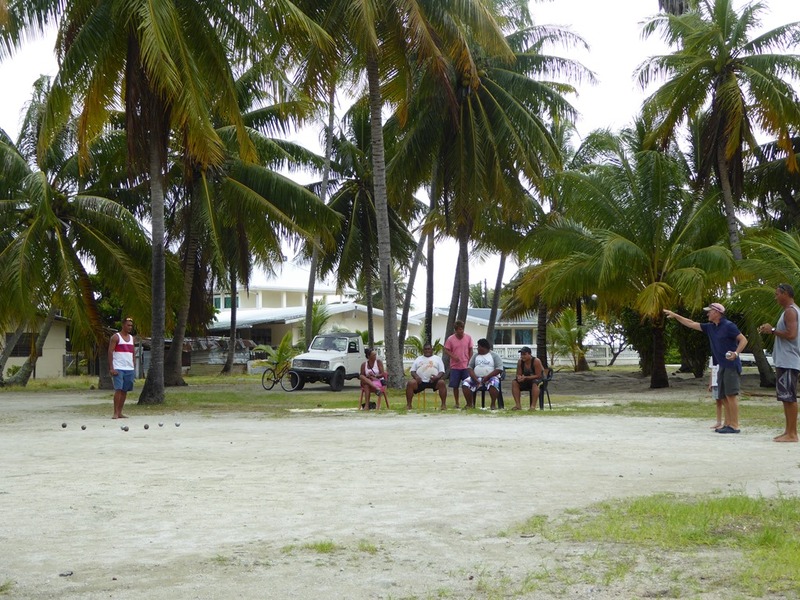 For day two and three, we had a petanque competition with first prize set as two chickens and two bags of rice. Lessor prizes included a bag of sugar. My partner, Olivier, and I won our first match but came up short against the eventual runners up in the second round, losing 7-5 after a tight match. We didn’t disgrace ourselves and it was good fun. It was pretty competitive with 16 teams playing. The winners were an older couple who were scarily good. With a decent weather window approaching and little to attract us around the village, we decided to head for Fakarava, 35 miles away to the W. We greatly enjoyed the SE corner of Kauehi and would thoroughly recommend it. The motus we were on gave us the wonderful feeling of being truly alone on our own desert island and the shallow snorkelling was excellent. One of the highlights of the Tuamotus so far. I am of mixed feelings on the village. The anchorage is pretty, the people are nice enough but there is little to see, (normally) less to do and I didn’t see anything there to attract us in. I think we might have been a little spoilt by Makemo. If there had been kids here, perhaps it would feel different. But I doubt it. 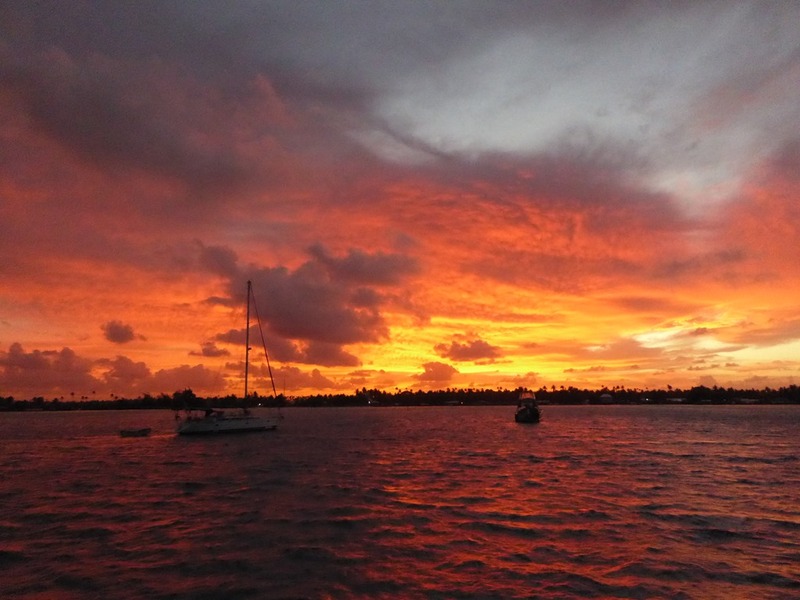 We left on 20 Sep as the sky burned at dawn, one of the best sunrises we have seen in the Pacific. We sailed, well reefed, at 8kts with a 20+kt ENE wind across to the pass and were fired out under sail being helped by a 2-3kt current. A very satisfying way to sign off on Kauehi. Finally for those that come after us , the girls have left some “buried treasure” on the motus we camped at. Perhaps of interest to Oliver on So What, Hannah left some Pokémon cards. Please add to the stash and pass the word out to other boat kids. We might even go as far as getting the hide logged on to Geocache. I reckon it is exotically far enough away for it to be rarely visited.